Maura McHugh runs the Irish Playwrights and Screenwriters Guild website and blog, and edits its fortnightly electronic newsletter. She also writes, and her short stories and poetry have appeared in markets in the USA and the UK. A script written by her has been made into a short film. 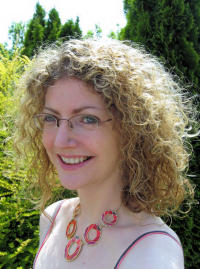 She has been on the juries of the Galway Junior Film Fleadh’s script pitching award and Octocon’s Golden Blasters Awards, and co-juried the Campaign for Real Fear short story contest with author Christopher Fowler last year. Róisín Dubh, a graphic novel she wrote, is forthcoming in 2011 from Atomic Diner. Because I am a Girl I ask… for tolerance, compassion, reason and justice. Because I am a Girl I believe… that every person has the ability to bring positive change to the world. Because I am a Girl I hope… for fairness and equality. Because I am a Girl I wonder… why I must still remind people that women’s work deserves equal attention. Because I am a Girl I dream… of a time when every person is accepted by society irrespective of gender, sexuality, ethnicity, class and physical or mental ability. Because I am a Girl I remember… to support other women in their endeavours, and to aid agencies that aim to better the lives of girls and women around the world. Because I am a Girl I like… a wide spectrum of things – technology, history, art, computer games, cinema, mythology, music, filmmaking, comic books, gadgets, writing, animation and fashion. Because I am a Girl I dislike… assumptions that are based on notions of how ‘women are supposed to act’. Because I am a Girl I feel… passionately about equal rights for women around the world. Because I am a Girl I… am a feminist. This entry was posted in Business, Charity, Uncategorized, Womens Rights and tagged Because I Am a Girl Campaign, blog, blogger, Business, Business owner, Charity, children, galway, Galway Junior Film Fleadh's script pitching award, Irish Playwrights and Screenwriters Guild, Maura McHugh, Octocon's Golden Blasters Awards, People in need, Plan, Plan Ireland, Real Fear short story contest, spinster, Sponsor, writer. Bookmark the permalink.